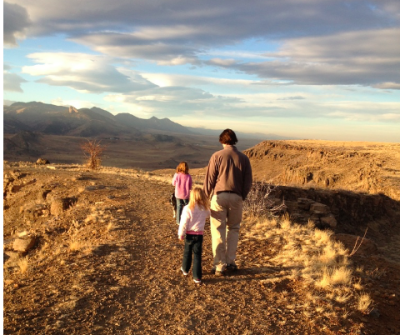 Family Hikes in Golden Rule! 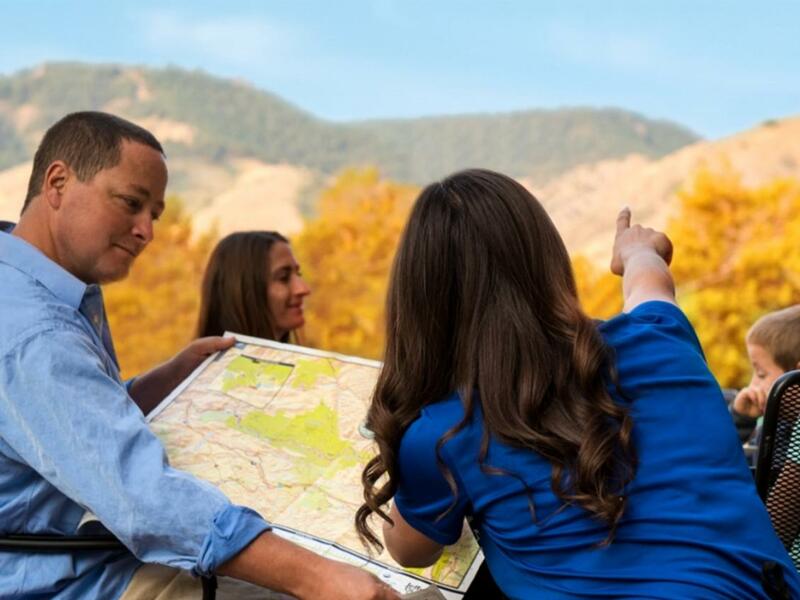 Hiking with the family is the perfect autumn adventure and there’s no better spot than Golden. With options for tots as well as teens, Golden has a hike sure to suit your family. Locals like to repeat Golden Rule #21: "Don&apos;t be surprised if someone tells you to take a hike," because many of our coffee shops and brunch spots are located near the trails. The first three hikes in our top recommendations below are well suited for parents and younger children while the final two family hikes are for more experienced hikers and older kids. 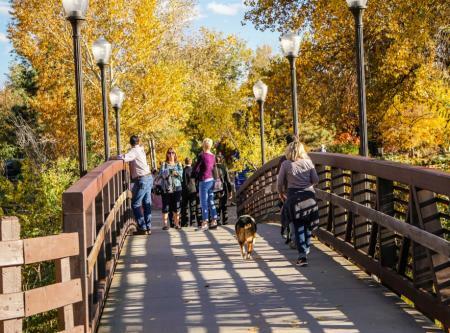 CLEAR CREEK TRAIL: Everyone’s favorite all weather, year-round trail follows Clear Creek from the center of historic downtown Golden up into the foothills – the beauty is you can decide just how far you want to go. You’ll pass Golden History Park, a historic farm museum (stop and feed the chickens), as well as the Golden History Museum and Golden Library. There are lots of sculptures (some are climbable) and even a slide the kids can swoosh down. You and the little ones will enjoy sitting down to watch the fly fishermen and kayakers enjoying the creek. DINOSAUR RIDGE & TRICERATOPS TRAIL: What better way to encourage your kiddos to hike than to add in fossils and dinosaur bones? Families love Triceratops Trail, a self-guided multi-purpose trail in Golden that guides visitors through 68 million years of Colorado pre-history, with footprints and impressions left by dinosaurs, birds, mammals, plants and insects. Also popular, Dinosaur Ridge is located a few miles south of Golden. Here you can see 100 million year old dinosaur tracks sitting atop layers of sand and mudstone, the pads of the toes and patterns of migration seen in over 300 footprints and 37 track ways. There’s also an onsite gift shop, educational workshops and interpretive programs. LOOKOUT MOUNTAIN NATURE CENTER & PRESERVE: Another fun spot to get an introduction to hiking is the gorgeous 1917 Boettcher Mansion on top of Lookout Mountain. Once a summer home for the Boettcher family, this beautiful log building has been turned in a museum along side a nature center in the middle of a preserve. The preserve has 1.4 miles of gentle trails that wind through ponderosa pine forests mixed with meadows of wildflowers. Exhibits in the center will tell you about the black bears, mountain lions, bobcats, elk, and mule deer that are often captured on the center’s cameras. APEX PARK: For older kids, Apex Park and the Enchanted Forest Trail is a local’s favorite. Start at the Lookout Mountain Nature Center and head south and walk downhill into Apex Park on the less known and less well used Enchanted Forest Trail, which is quiet and peaceful and takes you through a thick evergreen forest to the bottom of the canyon. Of course, what goes down must go up. So you will have a steep climb back up the canyon, unless you’ve made this a two car hike and parked a second car at the Heritage Road Apex Park Trailhead, in which case it’s just a nice 4.4 mile forest stroll downhill. NORTH TABLE MOUNTAIN: One of the chief landmarks of Golden is this broad, flat-topped mesa that rises hundreds of feet above the valley and is ringed by cliffs with a half dozen hiking and biking trails crisscrossing the area. The classic hike or bike trip is a moderate 5.9 mile loop trail that will take you around -- and over -- the mesa top, with 360 degree views of Golden, Denver and the Front Range. A parking area on Colorado Hwy. 93 just north of town has maps; trails head off clockwise or counterclockwise around the mountain. It’s a mixed-use trail with some steep climbs and single-track sections for bikers. Once on top, look for herds of deer and consider heading to Lichen Peak, which is the highest spot on North Table Mountain. We recommend a big breakfast in Golden followed by a family hike, but these trails are all so close to the Denver Metro area, you could even make it an after-school weekday outing. No matter when you decide to visit, hiking in Golden is sure to become a family favorite, because hiking in Golden Rules! Share your family hiking adventure and your own Golden Rule on social media and tag @visitgoldenco with #GoldenRules. For more information on Golden, check out VisitGolden.com.